Double bedroom on the second level of house, with an ensuite bathroom. The bathroom has a shower, toilet, basin and bath. The room has cupboards for 2 people. Dressing table with full length mirror, Bed with headboard and bedside tables. Sliding door to a balcony overlooking the sea, lagoon and mountains. Double bedroom on the second level of house, with an ensuite bathroom. The bathroom has bath, toilet, basin and a full length mirror. Twin bed with a side table, cupboards for one person, Curtains separate room from upper lounge area and are ideal for a child. Sliding door from room to a balcony overlooking the lagoon, sea and mountains. Twin bedroom on the first level of house, build inn cupboards, headboard with a bedside table. There is a TV, hairdryer and clock radio in the room. The bathroom has a shower, toilet, basin and laundry bin. The wendy house has two double bank beds, dressing table cupboard and side table, perfect for kids. 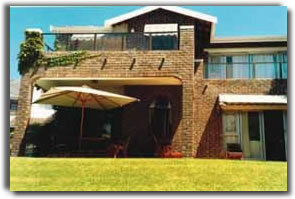 The guesthouse have 3 balcony patios with table and chairs, 2 loungers,2 umbrellas,2 braai areas. The downstairs lounge leading to the dining room and sliding door to the outside patio. The dining area is open plan to kitchen with a sliding door to the braai area. The kitchen have a scullery / laundry / pantry separate from kitchen, fully equipped kitchen from a microwave oven, I -level oven with glass top stove. The pantry has a fridge and freezer. The scullery have a dishwasher, tumble dryer and washing machine. The Laundry leads to a quart yard with washing line and a shower for cleaning after a day on the beach. The upstairs lounge area TV, dstv, decoder, hi fi, video machine, Relaxing lounge for reading and family time together. Beautiful garden with tall trees around the house.